Description: Solomon is one of the more complex and fascinating characters in the history of Israel. As a king he is second only to David. As the king who gave Israel its temple he is unsurpassed. As the prototype of the sage his name lives on in numerous biblical and non-biblical writings. As the magician of later tradition he has established himself as a model for many other aspirants in this field. This volume contains the proceedings of an international conference on Solomon that was held at the Faculty of Theology and Religious Studies of the University of Leuven, September 30 � October 2, 2009 and discussed various aspects of this multifaced character as he appears in Jewish, early Christian, and Islamic tradition. 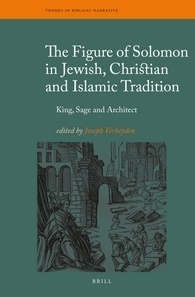 Citation: Anthony Swindell, review of Joseph Verheyden, ed., The Figure of Solomon in Jewish, Christian and Islamic Tradition: King, Sage and Architect, Review of Biblical Literature [http://www.bookreviews.org] (2014).